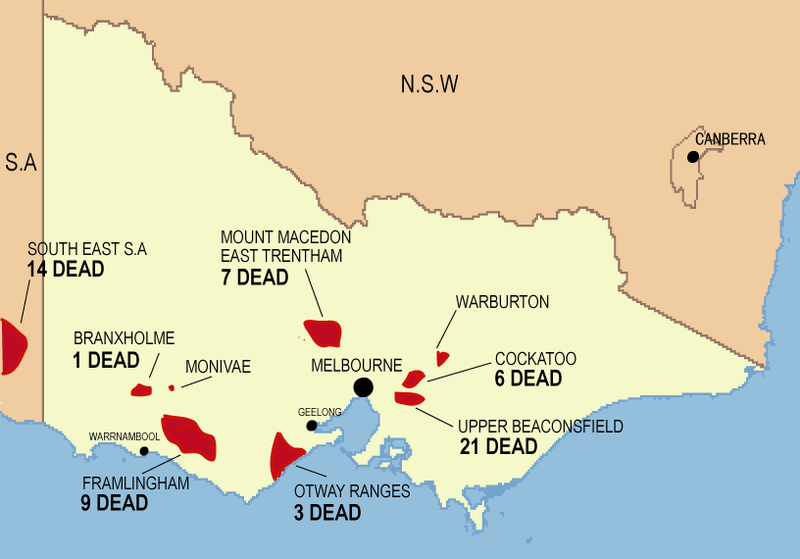 I first heard about Mount Macedon during the Ash Wednesday bushfires on 16 February 1983. At that time I thought they were called the Ash Wednesday bushfires because they, well, started on a Wednesday. I guess that wasn't a bad assumption to make considering that other bushfires on other days have been named after the day that they started. However I later discovered that the reason they called them the Ash Wednesday bushfires is not so much because fire tends to turn wood to ash, but rather because they started on Ash Wednesday, which is the first day of Lent on the Western Christian calender. I thought it would be a good idea to show you where you can find Mount Macedon. Anyway, I never thought much of Mount Macedon, except that it is a national park where you can go for a bush walk (not that I don't like bush walks), until a friend of mine showed me a photo of a massive cross on the top of the mountain. It was then that I decided that I might try hiking from the Macedon Railway Station up to the top of the mountain, take a selfie of me at the cross, post it on Facebook, and then walk back down again. Well, that ended up taking up five hours of my life, not that it was five hours that I consider wasted, it just ended up being a five hour walk (which obviously did not include the journey there and back by train, which was another four hours). with my trusty smartphone containing Google Maps (naturally) and a compass, I began my trek up the mountain. though I was a little concerned that if I touched him my friend would instantly become my best friend and start following me. The fact that it had a collar suggested that it was somebody else's best friend, so I didn't really want to get in the way of that relationship. Mind you, it would have been quite interesting if my friend had decided to follow me all the way up to the top of the mountain, and back again, but while he did follow me for a bit (namely because I felt the wet nose on my hand), I guess he decided that a walk up the mountain was not one of the things he really wanted to do at the time. The good thing about walking up mountains is that you generally don't get lost, because the mountain is right in front of you making it very difficult to misplace. Mind you, walking up the mountain, even on paved roads, is not the easiest of tasks, though I must admit it is much more enjoyable than sitting in a room peddling a bike that goes absolutely nowhere. I won't say too much about the town because I really didn't spend all that long looking around: the walk up the mountain was going to take up most of the day. However, what I did notice was that there were an awful lot of palatial estates around here. Okay, my auntie used to live on some acreage just outside of Melbourne, and it was a pretty nice house as well, however the houses I saw around here made her house look like a shack (not that you could actually see them). Walking further up Mount Macedon I passed a pile of wood in a paddock, which no doubt was being saved for a bonfire onr night (and I remember going to some of these bonfires). What was a little disappointing though was that I seemed to spend more time wondering past these estates than actually walking through bushland (which is what I really wanted to do). It was not until I was almost at the top that I entered the national park. There is also an historical cairn, with a sign posted nearby extolling the wonders of this ancient pile of rocks held together by cement. Anybody who is really interested in the history of surveying in Victoria could learn a lot from this marker. However, since I'm not one of those people, I shrugged my shoulders and continued walking towards the Memorial Cross. Fortunately there was a tea house near the summit, so I decided to stop off and have some tea and scones (actually it was a lemon muffin, but I guess that is close enough). Mind you the tea house wasn't cheap – I guess it is all of the fuel that they use lugging their supplies up to the top of the mountain. There was also a gallery inside, but the paintings didn't seem to impress me all that much (no Renoir) so I made my way towards the gate that would take me to the cross. I can't say it is my best shot, but then again what selfie is? when I suddenly realised that I now had to make my way back down. That wasn't all that much of a problem, except the direct route (that is the small track through the bush) had been closed due to the rangers lighting spot fires to clear away the undergrowth. That really brought a downer to the day because I was really looking forward to walking along a rough and narrow bush track, but I guess that is life. So I turned around and headed back the way I came. but it was little more than endless paddocks and there are much better views from much better mountains; anyway I had a train to catch. On my way back down I was fortunate enough to see a couple of Fat Yaks in a paddock. At least these two stood still. One even smiled for the camera. and had myself a Fat Yak.